Patra's Other Place: This month. Been a while since I posted anything here, so I have decided to publish a catch up post. Our front yard has been such a mess, with all the winds we’ve been having over summer. I thought I should at least rake all the leaves and twigs up. The thought of bending over and picking up the leaves to put into the bin made me feel ill, so when I saw our neighbour about to drive off with her oldest son, I called out over the fence to ask what the younger two were doing, and if they would like to earn a bit of pocket money. She said they would and when I asked how much to pay them, and would $10 be enough, she said "More than enough!" The two boys (12 and 14 approx.) appeared within minutes bringing their own rakes and gardening gloves, and their green wheelie bin. I raked, and they scooped everything up and piled it into the two bins. The yard was cleared in about 20 minutes - I was so grateful! I had $15 and two $50 bills in my purse, so I gave them the $15 and they ran off happily! Their Mum told me later I was way too generous! but if ever we needed help again, just call out. Ken came home from Bunnings just as the boys were leaving with their bin and rakes, and he was as pleased as I was to have the yard cleaned up. So nice to have such kind (and young and fit!) neighbours! My niece Susan's oldest son Peter was married last weekend and we attended the wedding with about 100 other guests. The church is a modern 'hall' type Anglican church (no spire, organ, or church pews as I remember them), and it seems that people can do their own thing and set it up however they like for a wedding. Peter is the president of the local brass band, so they were there to provide the music. He and his new wife Lizzie set the church up the day before, with chairs covered in fabric and a bow tied around each chair. Afternoon tea was provided after the wedding in an adjacent hall, while caterers converted the church hall into a reception room with trestles and chairs, and a spit roast. 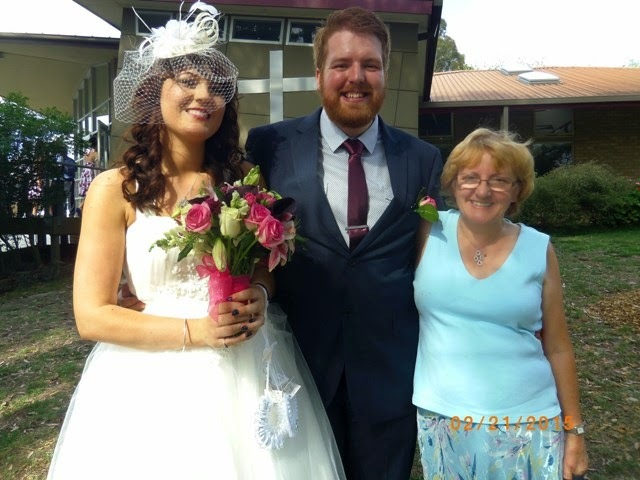 Here I am with Peter and his lovely bride Lizzie. They are both tall, and I feel like I've shrunk when I see myself in photos next to taller people! On Sunday afternoon we visited Ken's cousin David and his wife Yaso, who live in Clifton Hill in a terrace house that was built in 1873 or thereabouts. They are renovating it inside, but sympathetically to it's age, and it is looking fabulous. We piled 70 baby quilts in the back of the ute and delivered them to Yaso, who works with the PNG native people, and organises the distribution of our quilts to their babies. I was so pleased to get rid of all those boxes and bags out of our spare room! We had a lovely afternoon tea with them, and Yaso showed me some of the saris she has brought back from her last trip home to Malaysia to see her mother. She wants me to make a quilt from the saris but I’m reluctant to cut into such beautiful silk fabrics, so I’ll take it to some patchwork groups and see what they can advise. Ken has been selling some of his Gouldian finches and quails, which helps to make room for all the newly hatched babies. 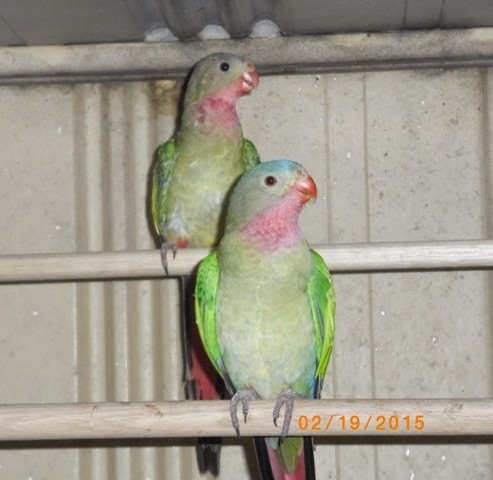 He bought two Princess Parrots recently and they are such a change from the smaller quiet finches; We love hearing them chortling away to each other. 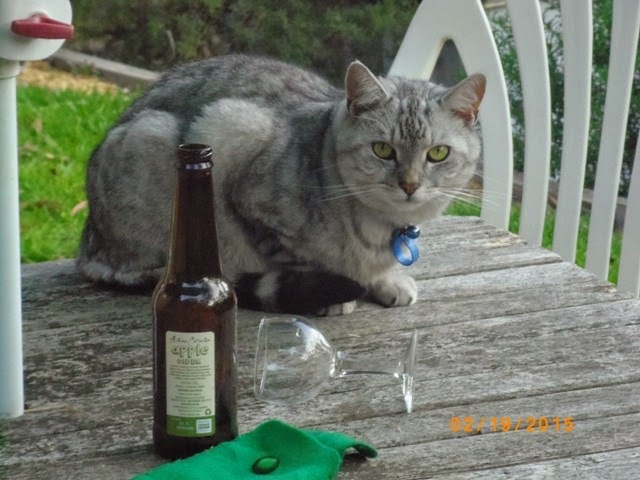 We had been having a cold drink while sitting watching the birds one day recently, and Tiger jumped up on the table and knocked over my empty glass. He looked so guilty, I had to take a photo! Sorry to hear that you've not been so well. We have aches and pains too but can walk ok at the moment (I'm 64 and Ross is 66. )Our walking group walks aren't all that long, maybe 6-8 miles usually, and we take it steadily and stop for a picnic lunch. We've always walked quite a lot but our normal daily(ish)walks are between 1 and a half and 3miles. But then it's not hot here! I could never walk much in heat. I hope you feel better soon. You look tiny next to the bride and groom! What a sweet photo of you Gina. Sarah, the yarn sounds beautiful! Better than leaving saris to rot in a cupboard for years..